When neurosurgeon Jake Breaker operates, he knows he's handling more than a patient's delicate brain tissue--he's altering their seat of consciousness, their golden vault of memory. And memory, Jake knows well, can be a tricky thing. When growing up in 1980s Niagara Falls, a.k.a. Cataract City--a seedy but magical, slightly haunted place--one of Jake's closest confidantes was his uncle Calvin, a sweet but eccentric misfit enamored of occult artefacts and outlandish conspiracy theories. The summer Jake turned twelve, Calvin invited him to join the "Saturday Night Ghost Club"--a seemingly light-hearted project to investigate some of Cataract City's more macabre urban myths. Over the course of that life-altering summer, Jake not only fell in love and began to imagine his future, he slowly, painfully came to realize that his uncle's preoccupation with chilling legends sprang from something buried so deep in his past that Calvin himself was unaware of it. I mostly know Craig Davidson through the all-out horror novels of his evil twin Nick Cutter. The Troop clearly showed a taste for Stephen King’s It. The Deep resembled a version of Abyss a bored Lovecraft might have rewritten from the tomb. The Acolyte–my favourite–was a fast-paced dystopia with a point to make about religion-based governments. For all of Cutter’s creativity and great style, I was still waiting for the book that would check all the boxes for me. The Saturday Night Ghost Club did it. I really, really enjoyed this novel. The Saturday Night Ghost Club is all about atmosphere. Dark nights, fleeting shadows, legends and tragedies, town mysteries, the natural creepiness that raises from old, abandoned and broken things, minds included. It’s all in subtleties. The story can be described as the coming of age of Jack, a shy and socially-awkward twelve-year-old living in Niagara Falls (nicknamed Cataract City). That summer, the stars are aligning well for Jack: a new kid just moved in town, offering a friendship he desperately needs. His uncle, an odd-ball running an esoteric shop, decides to take the kids to places of supernatural interest every week. At night. Of course, the story happens in the 80’s, with kids roaming free on bicycles, with nothing better to do than lighting stolen fireworks in a scrapyard. The novel reminisces again of It, but also of the more recent Stranger Things. I really enjoyed the focus on character development, and especially the take on the nature of fear. Jake is a fearful child, his uncle becomes his mentor and his friends his support. Together, they go through an exploration of fear and grow through it, taunting it, reflecting on it… maybe outgrowing it? 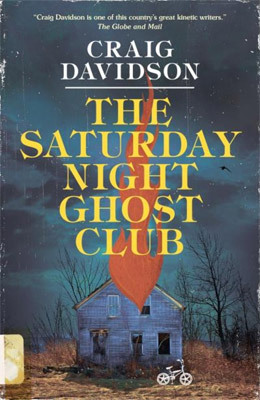 With its great atmosphere and relatable characters, The Saturday Night Ghost Club is a very strong novel… and my favourite one by Davidson-Cutter so far! It made me curious to explore the “Davidson-side” of the author and went straight away to his previous novel, Cataract City. I’ll let you know! Cataract City has a lot to recommend it, as I’m sure you’re discovering now. I enjoyed seeing the connections and diversions between those two books. I’m glad to hear, too, that the one book by Nick Cutter that I haven’t read yet is your favourite. Now I’m super excited that it’s waiting in the wings!